My husband actually found this item on Perpetual Kid. 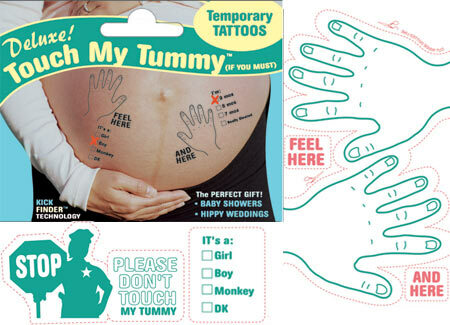 “Touch My Tummy Tattoos” (see picture above) are temporary tattoos that can be applied to a pregnant women’s tummy to say such things as “please don’t touch my tummy” or “feel here.” I personally wouldn’t want to put temporary tattoos all over my tummy, but I’m sure there are a lot of pregnant women in this world that would think this was the funniest and greatest thing ever and the website does say it’s a “baby shower best seller” so it must be great. I guess you could look at it as an inexpensive way to gain a laugh of two or at least a few funny and questionable faces once you lift your shirt to expose your tummy. What will they think of next?